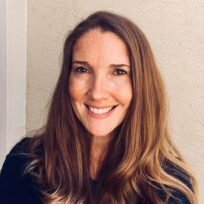 The transition from preschool to kindergarten is a big deal, and for a lot of kids (and parents) it causes anxiety as they worry about…well, everything. My second child just started and even though she was mostly excited, she did have nervous energy leading up to the big day. There are so many firsts that are wrapped up in going to kindergarten – riding a school bus, being away from home all day, eating lunch in a cafeteria, and making new friends. It’s understandable why our little ones might get a case of the butterflies. While they spend all summer eagerly anticipating (or dreading) all that lies ahead of them, it can be fun and helpful to read books that address some of their fears and answer their questions. Oftentimes when we have a greater understanding of a situation we feel more comfortable with it. Fortunately, the library shelves are filled with books about kindergarten so you can help your child cope with their emotions about this milestone and better prepare them for their first day of big kid school. A creative riff on the classic Christmas Poem The Night Before Christmas. 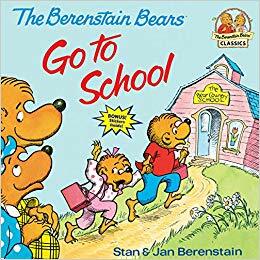 Only in this version, little kids are eagerly and nervously awaiting the start of kindergarten. They drift off to sleep thinking of school supplies and wake up excited to put on their new school clothes and backpacks. 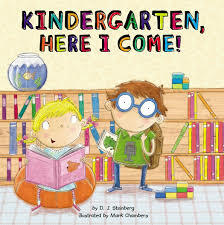 Once they arrive at school and meet their teacher, they find out just how fun kindergarten really is. And just like in real life, it’s the parents who have the hardest time saying goodbye. 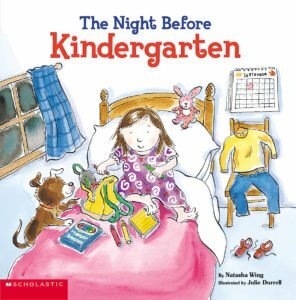 This book is a great way to send your kids off to sleep the night before their big day. This book will not only transport you back to your own childhood but also show your child it’s okay to feel nervous about situations they haven’t experienced before. As sister bear realizes summer is quickly coming to an end and kindergarten will soon be starting, she begins to feel worried and sad about what she’ll miss at home. With encouragement from her family and after visiting her classroom and meeting her teacher, she starts to feel excited for her first day. When the big day finally arrives she finds herself having so much fun she can’t wait to ride the yellow bus back to school the very next day. 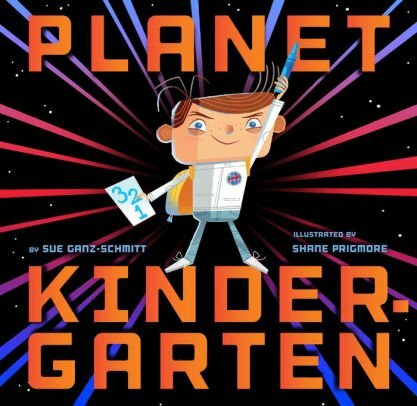 This book is a fun take on entering kindergarten by imagining you’re an astronaut who’s headed to a new planet. Planet kindergarten, of course. 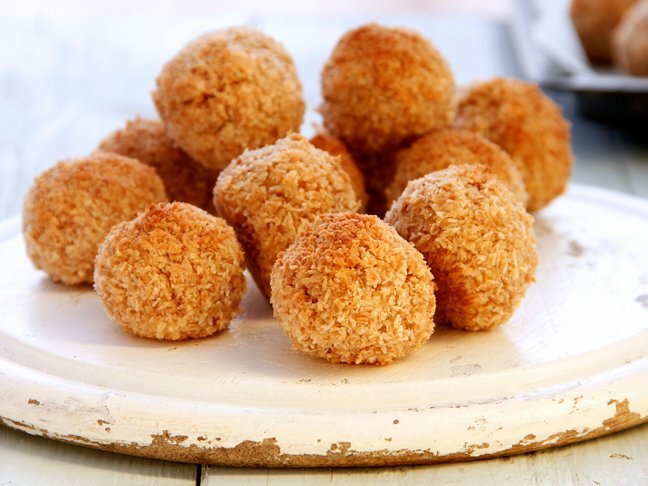 The kids embark on their newest mission with excitement and some trepidation as they explore the unknown parts of this planet – like space food in the lunch room. Their commander leads them through a successful mission and they’re all eager to come back the next day for another one. The vivid imagery and clever story will have your kid smiling and ready for their own countdown to blast off. This book is a series of short rhymes that all focus on a different kindergarten milestone, beginning with the checklist to make sure you have everything you need. Your child will love the silliness of this book and the fun illustrations showing the main character making his way through the exciting activities and events that take place during the school year, like field trips and class pets. It will leave your child curious and excited about what’s to come. If you haven’t read the Pout-Pout Fish series, you definitely need to add it to your reading list. Each story focuses on an important theme blended with colorful underwater illustrations. And who doesn’t love a main character who’s a fish? 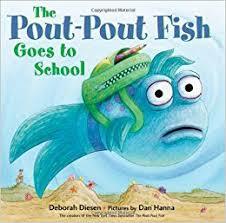 In this story, the pout-pout fish is nervous about going to school because he doesn’t know how to write his name or his shapes – until his teacher explains that school is for learning and being taught what you don’t already know. This book is great for encouraging your child and creating healthy dialogue about how we learn. While starting kindergarten can be hard for both you and your little one, it’s also a time full of excitement. As they grow more independent, make new friends, and discover that school is fun, they will be excited. Adjusting to new routines can be difficult, but taking the time to work through our fears is important. Cuddling up with a good book is a great way to bond and create a safe space for open communication.